TLRs are pattern recognition receptors that initiate innate immune responses. TLR9 detects microbial DNA with hypomethylated CpG motifs and in humans is preferentially expressed by IFN-α-producing plasmacytoid dendritic cells and B cells. In addition to favoring IFN-α release, TLR9 signals B cell activation, proliferation, and IgM production. Recent findings suggest that CpG DNA-TLR9 interaction plays a key role in systemic lupus erythematosus and rheumatoid arthritis, two autoimmune disorders characterized by dysregulated production of DNA-reactive IgG. We show that CpG DNA initiates germline Cγ1, Cγ2, and Cγ3 gene transcription by activating B cells through a TLR9-mediated NF-κB-Rel-dependent innate pathway that cooperates with IL-10 through STAT proteins and IFN-responsive factors. This pathway is inhibited by chloroquine, a drug that attenuates the clinical manifestations of IgG-mediated autoimmune disorders. Germline Cγ gene transcription is associated with up-regulation of activation-induced cytidine deaminase, a key element of the B cell class switch-inducing machinery, and is followed by class switch DNA recombination from Cμ to Cγ1, Cγ2, and Cγ3. Subsequent IgG production requires additional signals from BCR and a B cell-activating factor of the TNF family (BAFF), produced by dendritic cells upon exposure to IFN-α. Our findings suggest that CpG DNA-TLR9 interaction may be important to initiate or amplify early T cell-independent IgG responses against pathogens. This implies that CpG DNA released during infections may exacerbate autoimmunity by stimulating autoreactive B cells to switch from an IgM to a more pathogenic IgG isotype. By substituting the Ig CH region of IgM and IgD with that of IgG, IgA, or IgE, class switching endows Abs with new effector functions that enhance the clearance of invading pathogens (1). Germinal center B cells undergo IgH class switching through class switch DNA recombination (CSR), 3 a process that promotes recombination of the switch region μ(Sμ) 5′ of the Cμ gene with a targeted downstream Sγ, Sα, or Sε region 5′ of Cγ, Cα, and Cε, respectively (2, 3). Complex microbial proteins initiate CSR by up-regulating the TNF family member CD40L on CD4+ T cells (1). Engagement of CD40 on B cells by CD40L activates NF-κB-Rel (4), which initiates germline IH-S-CH transcription by binding cis-acting κB elements within intronic IH promoters 5′ of S regions (1). Germline transcription is further enhanced by T cell-derived IL-4 through STAT6, which binds a IFN-γ-activated sequence (GAS) adjacent to κB sites (1). By inducing chromatin opening, germline transcription facilitates the recruitment of activation-induced cytidine deaminase (AID), an enzyme that initiates CSR by introducing DNA breaks within S regions (5). Subsequent looping-out deletion of the DNA between the two recombined S regions juxtaposes the somatically recombined VHDJH exon, which encodes the Ag-binding Ig VH region, to a new CH gene (3). In addition to inducing CSR, T cell-dependent (TD) Ags stimulate germinal center B cells to undergo V(D)J gene somatic hypermutation, a process that increases the affinity of Abs for Ag (2, 5). Although generating high affinity Ig-secreting plasma cells and long-lived memory B cells (6), TD B cell responses require 5–7 days, which is too much of a delay to neutralize quickly replicating pathogens. To compensate for this limitation, marginal zone B cells and mucosal B-1 cells rapidly undergo T cell-independent (TI) Ab production in response to highly conserved microbial Ags with repetitive structure (7, 8). These compounds include type 1 TI Ags, such as bacterial wall LPS, and type 2 TI Ags, such as bacterial capsule polysaccharides (9). Both TI-1 and TI-2 Ags encompass pathogen-associated molecular patterns (PAMPs) (10), which stimulate marginal zone and B-1 cells by cross-linking poorly diversified surface BCRs encoded by a restricted set of V(D)J genes carrying no or few mutations (11). TI Ab production also requires interaction of B cells with dendritic cells (DCs) and macrophages (8, 12). These innate immune cells recognize PAMPs through pattern recognition receptors, including TLR family members (13). In addition to triggering immediate innate responses (10), PAMP-TLR interaction favors TI B cell Ab production. For instance, engagement of TLR4 by LPS stimulates myeloid DCs to up-regulate B cell-activating factor of the TNF family (BAFF) (10, 14), which cooperates with signals emanating from BCR to stimulate B cell survival, CSR, and Ab production (15, 16, 17). Myeloid DCs also up-regulate BAFF upon exposure to IFN-α (16), a key innate cytokine released by circulating plasmacytoid DCs upon TLR9 engagement by microbial products, including DNA with unmethylated CpG motifs (18, 19, 20, 21). Unlike TLR4, which is expressed on the cell surface (10), TLR9 is expressed in the endoplasmic reticulum and signals from an endosomal compartment upon CpG DNA internalization (22, 23). Not only do PAMPs stimulate B cells through BAFF, but they also directly activate B cells via TLRs. This is exemplified by LPS, which triggers mouse B cell CSR and Ab production by engaging TLR4 (1, 10). Human B cells lack TLR4, but express TLR9, and undergo proliferation and IgM production in response to CpG DNA (24, 25). The role of CpG DNA in human B cell CSR remains elusive. Unmethylated microbial CpG DNA is similar to certain CpG DNA islands within the mammalian genome (22, 26, 27). Hypomethylated genomic CpG DNA is increased in subjects with systemic lupus erythematosus (SLE) and rheumatoid arthritis (RA) (28), two autoimmune disorders characterized by abnormal B cell reactivity to a relatively restricted set of self-Ags, including DNA and DNA-bound proteins (29, 30, 31). Recent studies suggest that dual TLR9 and BCR engagement by endogenous CpG DNA released from dying cells and CpG DNA-IgG complexes stimulates autoreactive B cells to produce DNA-reactive IgM and IgM rheumatoid factors (RFs), which recognize DNA-bound IgG (32, 33). Considering that anti-DNA IgG is usually more abundant than anti-DNA IgM and that RF-expressing B cells produce IgG in addition to IgM (29, 30), it is conceivable that CpG DNA stimulates autoreactive IgG CSR in addition to IgM production. CD40L and BAFF induce CSR through p50, p52, p65, c-Rel, and RelB (1, 16). These NF-κB-Rel proteins are retained in a cytoplasmic inactive form by IκBα, an inhibitor of NF-κB (34, 35). By recruiting TNF receptor-associated factors (TRAFs) to their receptors, CD40L and, to a lesser extent, BAFF activate IκB kinase β (IKKβ) (4, 17), which is part of an IKK complex that includes two catalytic α and β subunits and a regulatory γ subunit (34, 35). Phosphorylation of IκBα by IKKβ is followed by IκBα degradation and p50, p65, and c-Rel nuclear translocation (34, 35). CD40L and, to a greater extent, BAFF also activate IKKα through NF-κB-inducing kinase (NIK) (34, 35). Phosphorylation of p100 by IKKα is followed by p100 processing to p52, which then translocates to the nucleus in association with RelB (34, 35). Similarly to CD40 and BAFF receptors, TLRs activate p50, p52, p65, c-Rel, and RelB through NIK and IKK (10). These kinases are turned on upon recruitment of MyD88, IL-1R-associated kinases (IRAKs), and TRAF6 to a cytoplasmic TLR/IL-1R (TIR) domain (36, 37, 38). This prompted us to hypothesize that TLR9 signaling initiates IgG CSR through NF-κB-Rel. We show that CpG-containing oligodeoxynucleotides (ODNs) and bacterial DNA initiate germline Cγ gene transcription in human B cells by turning on a TLR9 pathway that activates NF-κB-Rel, STATs, and IFN-responsive factors (IRFs) in cooperation with IL-10. CpG DNA-induced germline Cγ gene transcription is inhibited by chloroquine, a compound used to treat patients with SLE and RA (39), and ultimately leads to CSR from Cμto Cγ1, Cγ2, and Cγ3. Subsequent IgG production requires additional B cell stimulation through BCR engagement, BAFF, or CD40L. Peripheral blood IgD+IgM+ naive B cells were obtained as previously described (16). 2E2 B cells are characterized by high TLR9 expression levels and were obtained by subcloning CL-01, an IgD+IgM+ B cell line that undergoes CSR upon in vitro exposure to appropriate stimuli (40). CL-01 subclones were obtained by limiting dilution and tested for TLR9 expression through semiquantitative RT-PCR. Purified phosphorothioate-modified ODNs (Operon Technologies, Alameda, CA; lowercase letters represent nuclease-resistant phosphorothioate linkage, uppercase letters represent phosphorodiester linkage 3′ of the base, and underlined letters represent CpG dinucleotides), including 5′-tcgtcgttttgtcgttttgtcgtt-3′ ODN-2006/type B CpG DNA and 5′-ggGGGACGATCGTCgggggg-3′ ODN-2216/type-A CpG DNA, were used at 5 μg/ml. Control 5′-tgctgcttttgtgcttttgtgctt-3′ GpC DNA and 5′-GCTTGATGACTCAGCCGGAA-3′ non-CpG DNA (Operon Technologies) were used at 5 μg/ml. Escherichia coli DNA was purified by extraction with phenol/chloroform/isoamyl alcohol and ethanol precipitation, suspended in DNase-free distillated water, and used at 200 μg/ml. In some experiments E. coli DNA was digested with 50 μg/ml DNase I. Recombinant BAFF (Alexis Biochemicals, San Diego, CA), CD40L (Immunex, Seattle, WA), IL-2 (from Dr. K. A. Smith, Cornell University, New York, NY), IL-4 (Schering-Plough, Kenilworth, NJ), IL-10, IL-15, LPS (Sigma-Aldrich, St. Louis, MO), IL-6, and IL-13 (R&D Systems, Minneapolis, MN) were used at 500 ng/ml, 500 ng/ml, 50 U/ml, 200 U/ml, 200 ng/ml, 100 ng/ml, 1 μg/ml, 5 ng/ml, and 10 ng/ml, respectively, unless otherwise indicated. Immunobead reagent (Irvine Scientifics, Camarillo, CA), which binds both H and L chains of human Igs, was used at 2 μg/ml to mimic extensive BCR cross-linking by a TI Ag. Bafilomycin A and chloroquine (Sigma-Aldrich) were used at 10 nM and 20 ng/ml, respectively. B cell surface CD19 and IgG were labeled with FITC- and PE-conjugated Abs (BD Pharmingen, San Diego, CA). Cells (104) were acquired using a FACSCalibur analyzer. IgG ELISA was performed as previously described (16, 40). cDNA was reverse transcribed from 3 μg of total RNA. TLR9 was RT-PCR amplified for 25 cycles using forward primer 5′-ACAACAACATCCACAGCCAAGTGTC-3′ and reverse primer 5′-AAGGCCAGGTAATTGTCACGGAG-3′. Iγ1-Cγ1 (603 bp), Iγ2-Cγ2 (597 bp), Iγ3-Cγ3 (670 bp), Iγ4-Cγ4 (411 bp), Iε-Cε (409 bp), Iμ-Cμ (537 bp), Iγ1/2-Cμ (557 bp), Iγ3-Cμ (608 bp), AID (382 bp), and β-actin (593 bp) transcripts were amplified for 25 cycles as previously described (16). Genomic DNA was extracted by using the QIAmp DNA Mini Kit (Qiagen, Valencia, CA). Total Sγ-Sμ switch circles and β-actin were amplified from 500 ng of genomic DNA as previously described (16). The conditions were denaturation 1 min at 94°C, annealing 1 min at 68°C, and extension 4 min at 72°C for two rounds of 30 cycles each. Before each PCR, DNA was denatured for 5 min at 94°C. The identity of PCR products with switch circles was confirmed by DNA sequencing. PCR products were fractionated onto agarose gels, transferred overnight to nylon membranes, and hybridized with radiolabeled probes as described. Switch circles were hybridized with a probe recognizing the recombined Sμ region (16). Iγ-Cμ transcripts were hybridized with a probe encompassing nt 1–250 of the first Cμ exon. Iγ-Cγ transcripts were hybridized with a 5′-CAGGGGGAAGACCGATGG-3′ oligoprobe recognizing a consensus Cγ sequence. Finally, Iε-Cε transcripts were hybridized with a 5′-TCCACACAGAGCCCATC-3′ oligoprobe recognizing Cε. Genomic DNA fragments encompassing Iγ1, Iγ2, Iγ3, Iγ4, and Iε promoters were inserted into a promoterless pGL3-Basic luciferase (Luc) reporter vector (Promega, Madison, WI) as previously reported (40, 41, 42). κB1−, κB2−, IFN-stimulated responsive element (ISRE)-κB3−, B cell-specific activating protein-binding site (BSAP−), and GAS− Iγ3 mutants were generated through a PCR-based strategy that disrupts the targeted motif by replacing six nucleotides of the wild-type sequence with a SacI restriction site (40). Briefly, 5′ and 3′ DNA fragments were amplified using appropriate primers with 5′ overhangs containing KpnI (sense)/SacI (antisense) and SacI (sense)/BglII (antisense) sites, respectively. Then, DNA fragments were digested with KpnI/SacI, and SacI/BglII, respectively, and cloned into the KpnI/BglII-digested pGL3-Basic vector. Reporter vectors driven by two κB sites from the Igκ gene (from Dr. H.-C. Liou, Cornell University, New York, NY), three GAS sites from the Ly-6/E gene (from Dr. J. J. Zhang, Cornell University), four GAS sites from the CD23b gene (from Dr. J. J. Zhang), and ISRE sites from the ISG15 gene (from Dr. K. Horvath, Mount Sinai Medical Center, New York, NY) are reported elsewhere (43, 44, 45). Expression vectors for TLR9, Toll-like interacting protein (InvivoGen, San Diego, CA), dominant negative (DN)-IκBα (S32/36A; from Dr. E. Cesarman, Cornell University), DN-MyD88 (residues 152–296), DN-IRAK1 (residues 1–208; Tularik, San Francisco, CA), DN-TRAF2 (residues 248–501), DN-TRAF6 (residues 301–530; ScienceReagents, El Cajon, CA), DN-IKKα (K44M), DN-IKKβ (K49A), DN-NIK (K429/430A; from Dr. J.-D. Li, University of South California, Los Angeles, CA), DN-STAT1 (Tyr701F), DN-STAT3 (Y705F; from Drs. J. E. Darnell, Jr., and J. Bromberg, Rockefeller University, New York, NY), and DN-IRF4 (residues 1–150; from Dr. A. B. Pernis, Columbia University) were described previously (18, 20, 36, 44, 46, 47, 48). ΔTIR-TLR9 (residues 1–870) was PCR-amplified from a TLR9 plasmid (InvivoGen) using forward primer 5′-GGGGATATCTACTAGATTTATCAAAAAGAG-3′ and reverse primer 5′-GGGGCTAGCTAGGGCAGGGCATCCTCATC-3′. 2E2 B cells (20 × 106/ml) were transfected with 40 μl of plasmid DNA-TE solution containing 10 μg of Iγ-Luc, Iε-Luc, ISRE-Luc, or STAT-Luc plasmid expressing firefly luciferase and 200 ng of control pRL-TK plasmid expressing Renilla luciferase under control of the thymidine kinase promoter (Promega). Similar transfections were performed in the presence or the absence of 10 μg of empty expression plasmid or 10 μg of DN-MyD88, DN-IRAK1, DN-TRAF6, DN-TRAF2, Toll-interacting protein (TOLLIP), IκBα, DN-IKKα, DN-IKKβ, DN-NIK, DN-STAT1, DN-STAT3, or DN-IRF4 expression plasmid. Electroporations were performed at 625 V/cm and 950 μF using a Gene Pulser II apparatus (Bio-Rad, Hercules, CA). After electroporation, B cells were resuspended in complete medium (2 × 106/ml), split into aliquots, and cultured with or without stimuli. After 48 h, firefly and Renilla luciferase activities were measured using the dual luciferase assay system (Promega) to assess promoter activity and transfection efficiency, respectively. Luciferase activity was expressed as relative light units normalized to a cotransfected pRL-TK control plasmid or as fold induction, i.e., normalized luciferase activity of extracts from stimulated B cells/normalized luciferase activity of extracts from unstimulated B cells. Equal amounts of total, cytoplasmic, or nuclear proteins (10 μg) were fractionated onto a 10% SDS-polyacrylamide gel and transferred to nylon membranes (Bio-Rad). After blocking, membranes were probed with primary Abs to TLR9 (InvivoGen), p50, p52, p65, c-Rel, RelB, IκBα, STAT1, STAT2, STAT3, STAT6, IRF1, IRF9, actin, Oct1 (Santa Cruz Biotechnologies, Santa Cruz, CA), IRF4 (from Dr. A. B. Pernis, Columbia University, New York, NY), (Ser32p/Ser36p)-IκBα, (Tyr701p)-STAT1, (Tyr705p)-STAT3, (Tyr641p)-STAT6 (Cell Signaling Technology, Beverly, MA), or (Tyr689p)-STAT2 (Upstate Biotechnology, Lake Placid, NY). Membranes were then washed and incubated with an appropriate secondary Ab (Santa Cruz Biotechnology). Proteins were detected with an ECL detection system (Amersham Biosciences, Little Chalfont, U.K.). Nuclear proteins were extracted from 5 × 106 cells (40). Double-stranded oligonucleotide probes (consensus sequences are underlined or, when partially overlapping, underlined and in bold) encompassing κB2 cis-Iγ3 (residues −216 to −192, 5′-CCTCTGACACAGAAACCACCAGAAG-3′), ISRE-κB3 cis-Iγ3 (residues −198 to −176, 5′-CCAGAAGAAAAGGGAACTTCAGG-3′) and GAS cis-Iγ3 (residues −96 to −69, 5′-GAGCTGTGATTTCCTAGGAAGACAAA-3′) sites were end-labeled with [γ-32P]ATP by T4 kinase and used at ∼20,000 cpm in each EMSA reaction. A control Oct1-binding oligonucleotide (TGTCGAATGCAAATCACTAGAA; Santa Cruz Biotechnologies) was labeled in a similar fashion. Reaction samples were prepared as described, incubated at room temperature for 15 min, and electrophoresed through a 6% nondenaturing polyacrylamide gel. The compositions of DNA-bound protein complexes were determined by incubating reaction mixtures with 1 μl of a DNA-binding inhibiting/supershifting Ab to p65, c-Rel, Rel-B, p50, p52, STAT1, STAT2, STAT3, STAT6, IRF1, IRF9 (Santa Cruz Biotechnology), or IRF4 (from Dr. A. B. Pernis) for 15 min at room temperature before adding the probe. IL-10 and IL-4 are two major CSR-inducing cytokines (1, 16). Recent studies indicate that CpG DNA cooperates with autocrine IL-10 to enhance IgG production in B cells (25, 49). Additional reports show that CpG DNA inhibits IgG and IgE production in B cells exposed to IL-4 (49, 50). These observations prompted us to verify whether TLR9 expression differs in B cells exposed to IL-10 or IL-4. Human IgD+IgM+ naive B cells up-regulated TLR9 transcripts and proteins as early as 1 h after incubation with IL-10 (Fig. 1⇓A). This up-regulation peaked after 48 h and progressively increased upon B cell exposure to growing amounts of IL-10 (Fig. 1⇓B). Conversely, naive B cells down-regulated TLR9transcripts and proteins as early as 1 h after exposure to IL-4. This down-regulation was more evident after 48 h and progressively increased upon B cell exposure to growing amounts of IL-4. Thus, IL-10 and IL-4 may control B cell responses to CpG DNA by up- and down-modulating TLR9 expression, respectively. 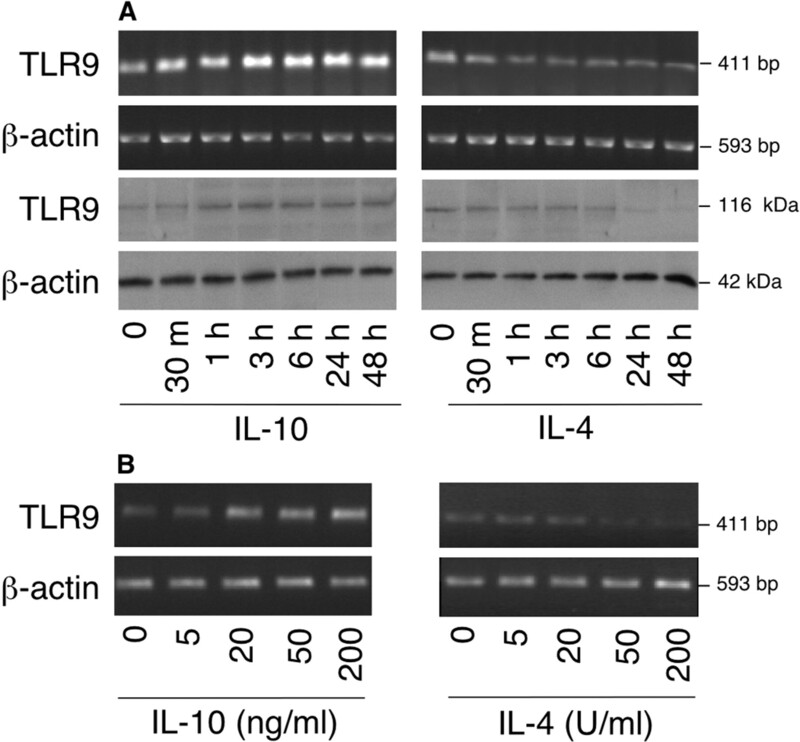 IL-10 up-regulates TLR9 expression in human B cells. A, TLR9 and actin (loading control) transcripts and proteins in naive B cells incubated with IL-10 or IL-4 for different time points. Transcripts were RT-PCR amplified for 30 cycles. B, TLR9 and β-actin transcripts in naive B cells incubated with different doses of IL-10 or IL-4 for 2 days. Transcripts were RT-PCR amplified for 25 cycles. Data in A and B depict one of three experiments yielding similar results. CSR from Cμ to a targeted downstream CH gene is preceded by germline IH-CH transcription (1). This early CSR event requires activation of the IH promoter 5′ of the targeted CH gene and yields a germline IH-CH transcript encompassing a noncoding IH exon (3). To verify whether CpG DNA initiates germline Iγ-Cγ and Iε-Cε gene transcription, primary IgD+IgM+ naive B cells or IgD+IgM+ 2E2 B cells, a subclone of the CL-01 B cell line (40), were incubated for 48 h with a CpG DNA-containing ODN (ODN-2006). Cultures were conducted in the presence or the absence of IL-10, which facilitates switching to IgG1, IgG2, and IgG3, and with or without IL-4, which favors switching to IgG1, IgG2, IgG3, IgG4, and IgE (1, 51). When exposed to CpG ODN-2006, naive B cells up-regulated germline Iγ1-Cγ1, Iγ2-Cγ2, and Iγ3-Cγ3, but not Iγ4-Cγ4 and Iε-Cε transcripts (Fig. 2⇓), whereas 2E2 B cells activated Iγ1, Iγ2, and Iγ3, but not Iγ4 and Iε promoters (Fig. 3⇓). The combination of CpG ODN-2006 and IL-10 up-regulated Iγ1-Cγ1, Iγ2-Cγ2, and Iγ3-Cγ3 and activated Iγ1, Iγ2, and Iγ3 more effectively than CpG ODN-2006 or IL-10 alone. Control GpC ODN-2006 with inverted CpG motifs did not up-regulate Iγ1-Cγ1, Iγ2-Cγ2, and Iγ3-Cγ3, nor did it enhance the IL-10-induced up-regulation of Iγ1-Cγ1, Iγ2-Cγ2, and Iγ3-Cγ3. Similarly, GpC ODN-2006 did not activate Iγ1, Iγ2, and Iγ3 or enhance IL-10-mediated activation of Iγ1, Iγ2, and Iγ3. CpG DNA cooperates with IL-10 to up-regulate germline Iγ1-Cγ1, Iγ2-Cγ2, and Iγ3-Cγ3 transcripts in human B cells. Germline Iγ1-Cγ1, Iγ2-Cγ2, Iγ3-Cγ3, Iγ4-Cγ4, Iε-Cε, and Iμ-Cμtranscripts in naive B cells cultured with or without CpG DNA ODN-2006, GpC ODN-2006, IL-10, and/or IL-4 for 2 days. Data depict one of three experiments yielding similar results. CpG DNA cooperates with IL-10 to induce germline Cγ1, Cγ2, and Cγ3 gene transcription in human B cells. 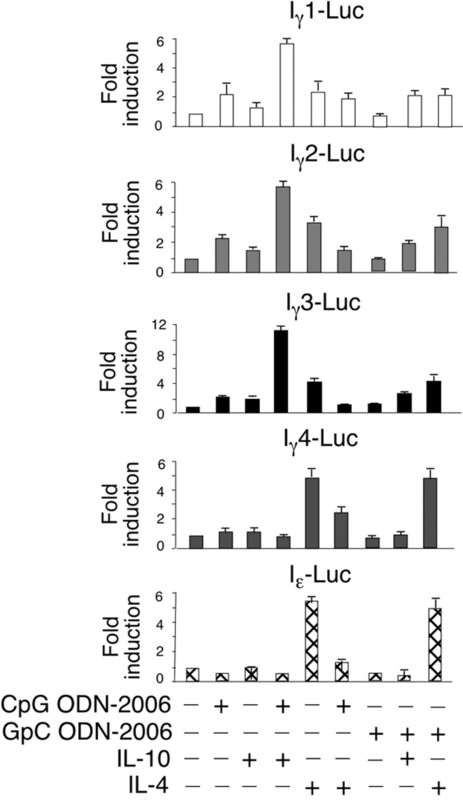 Induction of Iγ1-Luc, Iγ2-Luc, Iγ3-Luc, Iγ4-Luc, and Iε-Luc in 2E2 B cells cultured with or without CpG DNA ODN-2006, GpC ODN-2006, IL-10, and/or IL-4 for 2 days. Data correspond to one of three experiments yielding similar results (bars represent the SD of triplicate determinations). Unlike IL-10, IL-4 up-regulated Iγ1-Cγ1, Iγ2-Cγ2, Iγ3-Cγ3, Iγ4-Cγ4, and Iε-Cε transcripts and activated Iγ1, Iγ2, Iγ3, Iγ4, and Iε promoters. These effects were attenuated by CpG ODN-2006, but not by GpC ODN-2006, suggesting that CpG DNA cooperate with some, but not all, cytokines to initiate CSR. Consistent with this, CpG ODN-2006 did not activate Iγ3 when combined with IL-2, IL-6, IL-12, IL-13, or IL-15 (Fig. 4⇓A). The Iγ3-inducing activity of type B CpG ODN-2006 was comparable with that of CD40L, but was higher than that of type A CpG ODN-2216, and extended to bacterial CpG DNA. In addition to inducing Iγ3, bacterial DNA activated NF-κB-Rel, which is crucial for initiation of germline Cγ gene transcription (1). These effects were specific, because a non-CpG oligo, GpC ODN-2006, DNase I-treated bacterial DNA, and LPS did not activate NF-κB-Rel and Iγ3 (Fig. 4⇓B). Our findings indicate that CpG DNA preferentially cooperates with IL-10 to activate B cells and initiate germline Cγ1, Cγ2, and Cγ3 transcription. They also suggest that CpG DNA inhibits IL-4-induced Cγ and Cε transcription. CpG DNA induces germline Cγ3 gene transcription and NF-κB-Rel activation in human B cells through a highly specific mechanism. A, Induction of Iγ3-Luc in 2E2 B cells cultured with or without CpG DNA ODN-2006, IL-2, IL-6, IL-10, IL-12, IL-13, and IL-15 for 2 days. B, Induction of Iγ3-Luc and κB-Luc in 2E2 B cells cultured with or without non-CpG DNA, GpC ODN-2006, CpG ODN-2216, CpG ODN-2006, bacterial DNA, DNase I-treated bacterial DNA, LPS, or htCD40L for 2 days. Data correspond to one of three experiments yielding similar results (bars represent the SD of triplicate determinations). Additional experiments verified whether CpG DNA triggers IgG CSR in B cells. CSR requires AID and generates a circular DNA upon looping-out deletion of the IgH locus lying between Sμ and the targeted downstream S region, such as Sγ (Fig. 5⇓A). The resulting Sγ-Sμ switch circle transcribes a chimeric Iγ-Cμ circle transcript, which includes the Iγ promoter 5′ of the targeted Cγ gene, a noncoding Iγ exon, and the Cμ exon. Both switch circles and circle transcripts constitute specific markers of ongoing CSR (5). Naive B cells exposed to IL-10 and/or control GpC ODN-2006 for 4 days did not contain Sγ-Sμ switch circles (Fig. 5⇓B), a byproduct of IgG CSR, nor did they express Iγ1/2-Cμ and Iγ3-Cμ circle transcripts, a byproduct of IgG1/IgG2 CSR and IgG3 CSR, respectively. Similarly treated B cells lacked AID transcripts. In contrast, naive B cells induced Sγ-Sμ, Iγ1/3-Cμ, Iγ3-Cμ, and AID upon exposure to CpG ODN-2006, and this induction further increased when CpG ODN-2006 was combined with IL-10. Conversely, IL-4 attenuated the expression of Sγ-Sμ, Iγ1/3-Cμ, Iγ3-Cμ, and AID in B cells exposed to CpG ODN-2006 (not shown). These findings indicate that CpG DNA triggers CSR to Cγ1, Cγ2, and Cγ3 by cooperating with IL-10. CpG DNA cooperates with IL-10 to induce CSR from Cμ to Cγ1, Cγ2, and Cγ3 in human B cells. A, Diagram of CSR from Cμ to a downstream Cγ gene. Ovals indicate S regions; rectangles are VHDJH, IH and CH exons; V-shaped lines indicate splicing. B, Sγ-SμSCs, genomic β-actin, Iγ1/2-Cμ2 and Iγ3-CμCTs, and AID and β-actin transcripts in naive B cells cultured with or without CpG DNA ODN-2006, GpC ODN-2006, IL-10, and/or IL-4 for 4 days. C and D, Surface IgG expression and IgG secretion by naive B cells cultured with or without CpG DNA ODN-2006, GpC ODN-2006, IL-10, IL-4, anti-BCR, BAFF, and/or CD40L for 8 days. n.d., not determined. Data in B–D represent one of three independent experiments yielding similar results (bars represent the SD). To verify whether CpG DNA up-regulates IgG production, naive B cells were exposed to CpG ODN-2006 and IL-10 in the presence or the absence of known CpG DNA-costimulating molecules, including anti-BCR and CD40L (24, 25, 49). Cultures also included BAFF, which is produced by myeloid DCs upon exposure to CpG DNA-induced cytokines, including IFN-α (16, 19). Naive B cells up-regulated surface IgG upon exposure to CpG ODN-2006 (but not GpC ODN-2006) and IL-10, anti-BCR, BAFF, or CD40L for 5 days (Fig. 5⇑C). The proportion of IgG-expressing B cells further increased when CpG ODN-2006 was combined with either IL-10 and anti-BCR or IL-10 and BAFF, or IL-10 and CD40L. This increase was incremental over that induced by either IL-10 and anti-BCR or IL-10 and BAFF, or IL-10 and CD40L. Finally, CpG ODN-2006 and IL-10 elicited IgG secretion only in B cells concomitantly exposed to anti-BCR, BAFF, or CD40L for 8 days (Fig. 5⇑D). This suggests that CpG DNA requires IL-10 as well as additional TI or TD stimuli, including BAFF or CD40L, to stimulate IgG production in Ag-activated B cells. CD40 activates initiates NF-κB-Rel-dependent germline Cγ transcription by recruiting TRAFs, including TRAF2 and TRAF6 (47, 52). Because TLR9 activates NF-κB-Rel by recruiting MyD88, IRAK, and TRAF6 through a cytoplasmic TIR domain (10), it was hypothesized that the TLR9-MyD88-IRAK-TRAF6 axis is crucial for the initiation of IgG CSR by CpG DNA. Consistent with this, enforced expression of TIR-less TLR9 (ΔTIR-TLR9), DN-MyD88, DN-IRAK1, or TOLLIP, an adapter protein that negatively regulates TLR signaling (53), inhibited the activation of Iγ3-Luc in 2E2 B cells exposed to CpG ODN-2006 for 48 h (Fig. 6⇓A). In these cells, ΔTIR-TLR9, DN-MyD88, DN-IRAK1, or TOLLIP inhibited NF-κB-Rel-dependent activation of a minimal κB-Luc reporter vector. As expected, DN-MyD88, DN-IRAK1, or TOLLIP did not inhibit activation of Iγ3-Luc and κB-Luc by CD40L. 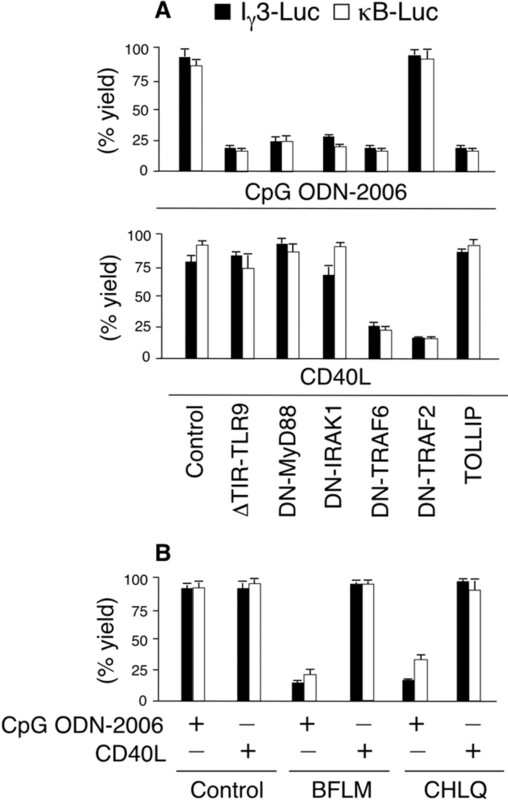 Furthermore, a DN form of TRAF2 attenuated activation of Iγ3-Luc and κB-Luc by CD40L, but not by CpG ODN-2006. Finally, a DN form of TRAF6 attenuated the activation of Iγ3-Luc and κB-Luc by either CpG ODN-2006 or CD40L. These findings suggest that CpG DNA activates Iγ promoters as well as NF-κB-Rel through an innate pathway that requires TLR9, MyD88, IRAK1, and TRAF6. CpG DNA requires TLR9, MyD88, IRAK, and TRAF6 to activate the Iγ3 promoter in human B cells. A, Induction of Iγ3-Luc and κB-Luc in 2E2 B cells transfected with empty vector (control), ΔTIR-TLR9, DN-MyD88, DN-IRAK1, DN-TRAF6, DN-TRAF2, or TOLLIP and subsequently incubated with CpG DNA ODN-2006 or CD40L for 2 days. Data are presented as a percentage of the yield (fold activation with expression vector/fold activation without expression vector × 100). B, Induction of Iγ3-Luc and κB-Luc in 2E2 B cells incubated for 48 h with CpG DNA ODN-2006 or CD40L in the presence or the absence of control H2O, bafilomycin A (BFLM) or chloroquine (CHLQ). H2O, BFLM or CHLQ were added 6 h before CpG DNA ODN-2006 or CD40L. Data are presented as a percentage of the yield (fold activation with H2O, BFLM or CHLQ/fold activation without H2O, BFLM or CHLQ × 100). Data in A and B correspond to one of three experiments yielding similar results (bars represent the SD of triplicate determinations). Innate immune cells internalize CpG DNA and initiate TLR9 signaling through a mechanism that requires endosomal maturation and acidification (23). Consistent with this, inhibitors of endosomal maturation and acidification, such as bafilomycin-A and chloroquine, attenuate cell activation by CpG DNA (32, 39). Chloroquine and its derivatives might also block CpG DNA signaling by preventing CpG DNA binding to as yet elusive surface receptors (22, 26). Bafilomycin-A and chloroquine attenuated the activation of both Iγ3-Luc and κB-Luc in 2E2 B cells exposed to CpG ODN-2006 (Fig. 6⇑B). In contrast, bafilomycin-A and chloroquine did not affect the activation of Iγ3-Luc and κB-Luc in 2E2 B cells exposed to CD40L. These data suggest that CpG DNA activates Iγ promoters and NF-κB-Rel through a chloroquine-sensitive B cell pathway. Germline Cγ gene transcription requires key cis-acting DNA regulatory elements located within the evolutionarily conserved sequence (ECS) of Iγ promoters (Fig. 7⇓A). The human ECS includes three κB sites (κB1, κB2, and κB3), a BSAP, and a STAT-binding GAS (1, 40). CD40L-induced Cγ gene transcription involves binding of NF-κB-Rel and BSAP to κB1, κB2, and BSAP sites, whereas IL-4-induced Cγ gene transcription requires binding of STAT6 to the GAS site. This latter can bind STAT1, STAT2, STAT3, and IRF4 in addition to STAT6 (44, 46, 54, 55, 56). Interestingly, the ECS contains also an ISRE site, which partially overlaps with κB3 (ISRE-κB3) (40). In general, ISRE binds the STAT1-STAT2-IFR9 complex as well as IRFs, including IRF1 and IRF4 (44, 56). STATs and IRFs are induced by several receptors, including TLRs and IL-10Rs, and cooperate with NF-κB-Rel proteins to modulate B cell activation, differentiation, and IgG production (44, 46, 50, 54, 55, 56, 57, 58, 59). Thus, it was postulated that CpG DNA and IL-10 initiate Cγ transcription upon NF-κB-Rel, STAT, and IRF binding to cooperative κB, ISRE, and GAS cis-Iγ sites. To verify this, 2E2 B cells were transfected with reporter vectors carrying wild-type Iγ3 or mutated Iγ3 with targeted disruptions of κB1, κB2, ISRE-κB3, BSAP, and GAS (43). In 2E2 B cells incubated with medium alone, wild-type and mutated Iγ3 promoters displayed similar transcriptional activity (Fig. 7B⇓). 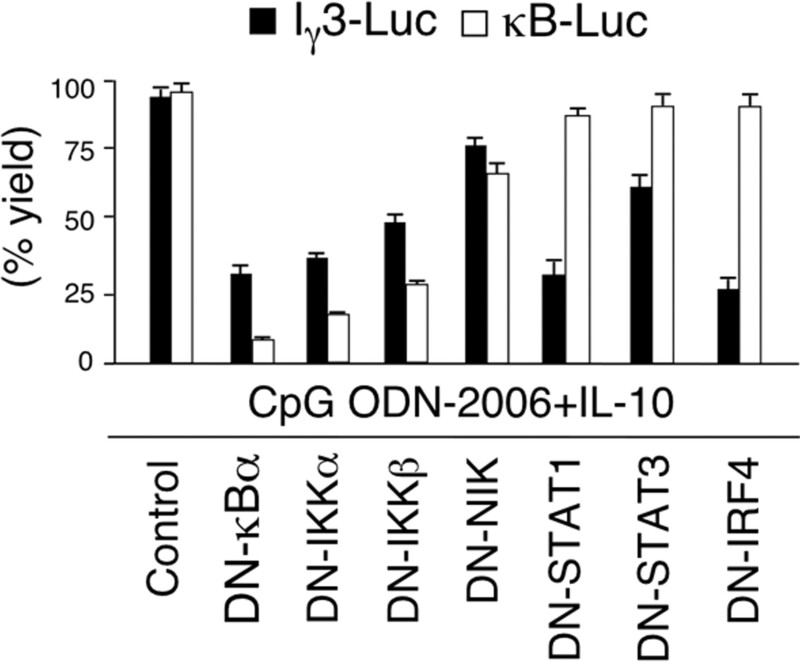 Disruption of κB1 or BSAP did not affect activation of Iγ3 by CpG ODN-2006 and/or IL-10. In contrast, disruption of κB2, κB3-ISRE, or GAS impaired activation of Iγ3 by CpG ODN-2006 and/or IL-10. These findings suggest that CpG DNA and IL-10 require κB2, κB3, ISRE, and GAS, but not κB1 and BSAP, cis-acting motifs to initiate germline Cγ3 transcription. CpG DNA and IL-10 require adjacent κB2, ISRE-κB3, and GAS cis-acting motifs to trans-activate the Iγ3 promoter in human B cells. A, Diagram of the Iγ3 promoter. Boxes depict cis-κB, ISRE, BSAP, and GAS motifs within the ECS. −239 and −65 residues span the ECS, and the turned arrow indicates the transcription initiation site. Pγ3 indicates the promoter sequence 5′ of the noncoding Iγ3 exon. B, Transcriptional activity of wild-type (wt) Iγ3 or mutated κB1−, κB2−, ISRE-κB3−, BSAP−, and GAS− Iγ3 Luc constructs in 2E2 B cells cultured with or without CpG DNA ODN-2006 and/or IL-10 for 2 days. The luciferase activity of 2E2 cells incubated with medium alone (control) is expressed as relative luciferase units (RLU). Data correspond to one of three independent experiments (bars represent the SD of triplicate determinations). Given the key role of κB2 and ISRE-κB3 in the activation of Iγ3 by CpG ODN-2006 and IL-10, it was postulated that CpG DNA and IL-10 synergistically induce Cγ gene transcription by cooperatively activating NF-κB-Rel. Initial experiments tested the induction of transcriptionally active NF-κB-Rel. 2E2 B cells activated a minimal κB-Luc reporter vector upon exposure to CpG ODN-2006, but not GpC ODN-2006, for 48 h (Figs. 3⇑B and 8A). When combined, CpG ODN-2006 and IL-10 induced κB-Luc more than either CpG ODN-2006 or IL-10 alone (Fig. 8⇓A). Additional studies evaluated NF-κB-Rel nuclear translocation. When exposed to CpG ODN-2006 for 3 h, naive B cells up-regulated IκBα phosphorylation and down-regulated total IκBα, a hallmark of increased IκBα degradation (Fig. 8⇓B). After 6 h, CpG ODN-2006 up-regulated the expression of nuclear p65, p50, c-Rel, p52, and RelB (Fig. 8⇓C). Also, IL-10 activated κB-Luc and up-regulated IκBα phosphorylation, IκBα degradation, and NF-κB-Rel nuclear translocation, although less than CpG ODN-2006. When combined, CpG ODN-2006 and IL-10 induced more IκBα phosphorylation, IκBα degradation, and NF-κB-Rel nuclear translocation than CpG ODN-2006 or IL-10 alone. Thus, CpG DNA and IL-10 cooperatively activate p65, p50, c-Rel, p52, and RelB in B cells. CpG DNA and IL-10 induce transcriptionally active NF-κB-Rel and up-regulate NF-κB-Rel binding to κB2 cis-Iγ3 in human B cells. A, κB-Luc activity in 2E2 B cells incubated with or without CpG ODN-2006, IL-10, and/or IL-4 for 2 days. B and C, Cytoplasmic pIκBα, IκBα, and actin proteins as well as nuclear p65, p50, c-Rel, p52, and RelB proteins in naive B cells cultured as in A for 1 h. The ubiquitous nuclear protein octamer 1 (Oct1) was used as loading control. D, Aligned −232/−176 Iγ3, Iγ1, and Iγ2 DNA sequences. The boxed sequence corresponds to the κB2 cis-Iγ3 motif. Left gels show nuclear protein binding to an oligonucleotide encompassing κB2 cis-Iγ3 or a consensus Oct1-binding motif. Nuclear extracts were from naive B cells cultured for 6 h as described in A. Italic letters indicate protein-DNA complexes. Right gel shows protein-DNA complexes from naive B cells activated with CpG DNA after nuclear protein incubation with a cold κB2 cis-Iγ3 probe or Abs to p50, p52, p65, c-Rel, and RelB. Asterisks indicate lanes in which complexes are attenuated or supershifted by the Ab. Data in A–D correspond to one of three experiments yielding similar results (bars represent the SD of triplicate determinations). IL-4 activated κB-Luc and up-regulated IκBα phosphorylation, IκBα degradation, and NF-κB-Rel nuclear translocation. Compared with IL-4 or CpG ODN-2006 alone, CpG ODN-2006 and IL-4 did not significantly increase κB-Luc activation, IκBα phosphorylation, IκBα degradation, or NF-κB-Rel nuclear translocation. These findings indicate that IL-4 does not cooperate with CpG DNA to activate NF-κB-Rel. We next evaluated whether CpG DNA and IL-10 up-regulate the binding of nuclear NF-κB-Rel to κB2 cis-Iγ3. Naive B cells up-regulated the binding of complexes a, b, c, d, e, f, and g to κB2 cis-Iγ3 upon incubation with CpG ODN-2006 for 6 h (Fig. 8⇑D). These complexes were attenuated or supershifted by preincubating nuclear proteins with Abs to p65, p50 and p65, p50 and c-Rel, p52 and RelB, p50 and RelB, p50 and p52, and p50, respectively. IL-10 up-regulated complexes a, b, c, d, e, f, and g to κB2 less than CpG ODN-2006, whereas CpG ODN-2006 and IL-10 up-regulated complexes a, b, c, d, e, f, and g more than CpG ODN-2006 or IL-10 alone. Additional experiments evaluated whether CpG DNA and IL-10 up-regulate the binding of nuclear NF-κB-Rel to ISRE-κB3 cis-Iγ3. Naive B cells up-regulated the binding of nuclear complexes a, b, and c to ISRE-κB3 cis-Iγ3 upon incubation with CpG ODN-2006 for 6 h (Fig. 9⇓A). These complexes were attenuated or supershifted by Abs to p50, p52, p65, c-Rel, and RelB; p50, p56, and c-Rel; and p50, respectively (Fig. 9⇓B). IL-10 up-regulated complexes a, b, and c less than CpG ODN-2006, whereas CpG ODN-2006 and IL-10 up-regulated complexes a, b, and c more than CpG ODN-2006 or IL-10 alone. Thus, CpG DNA cooperates with IL-10 to increase p50, p52, p65, c-Rel, and RelB binding to Iγ3. CpG DNA and IL-10 up-regulate NF-κB-Rel, STAT, and IRF binding to ISRE-κB3 cis-Iγ3 in human B cells. A, Aligned −232/−176 Iγ3, Iγ1, and Iγ2 DNA sequences. The boxed sequence corresponds to the ISRE-κB3 motif. Gels show nuclear protein binding to a radiolabeled oligonucleotide encompassing ISRE-κB3 cis-Iγ3 or a consensus Oct1-binding motif (loading control). Nuclear extracts were from naive B cells cultured with or without CpG ODN-2006, IL-10, and/or IL-4 for 6 h. Italic letters indicate shifted protein-DNA complexes. B, ISRE-κB3 cis-Iγ3-binding protein-DNA complexes from naive B cells activated with CpG DNA after nuclear protein incubation with a cold probe or Abs to p50, p52, p65, c-Rel, and RelB. Asterisks indicate lanes in which complexes are attenuated or supershifted by the Ab. C, ISRE-κB3 cis-Iγ3-binding protein complexes from naive B cells activated with CpG DNA after nuclear protein incubation with a cold probe or Abs to STAT1, STAT2, STAT3, STAT6, IRF1, IRF4, or IRF9. Asterisks indicate lanes in which complexes are attenuated or supershifted by the Ab. Data in A–C correspond to one of three experiments yielding similar results. IL-4 up-regulated the binding of complexes a, b, c, d, e, f, and g to κB2 (Fig. 8⇑D) as well as the binding of complex c to ISRE-κB3, but did not affect the binding of complexes a and b to ISRE-κB3 (Fig. 9⇑A). Compared with IL-4 or CpG ODN-2006 alone, CpG ODN-2006 and IL-4 attenuated the binding of complexes d and e to κB2, but did not affect or even increased the binding of complexes a, b, c, f, and g to κB2 as well as the binding of complexes a, b, and c to ISRE-κB3. Finally, CpG ODN-2006 and IL-4 up-regulated the binding of complexes a, b, c, d, and e to κB2 less efficiently than CpG ODN-2006 and IL-10. These findings suggest that IL-4 does not cooperate with IL-10 to up-regulate p50, p52, p65, c-Rel, and RelB binding to Iγ3. Considering the key role of ISRE-κB3 and GAS sites in Iγ3 transcription, it was hypothesized that CpG DNA and IL-10 synergistically activate the Cγ3 gene by cooperatively activating STATs and IRFs. Reporter vectors carrying multiple ISRE sites (ISRE-Luc), STAT1/3-binding GAS sites (STAT1/3-Luc), and STAT6-specific GAS sites (STAT6-Luc) were used to test the induction of transcriptionally active STATs and IRFs. 2E2 B cells activated ISRE-Luc, STAT1/3-Luc, and, to a lesser extent, STAT6-Luc upon exposure to CpG ODN-2006 or IL-10, but not GpC ODN2006, for 48 h (Fig. 10⇓A). When combined, CpG ODN-2006 and IL-10 activated ISRE-Luc and STAT1/3-Luc more efficiently than CpG ODN-2006 or IL-10 alone. 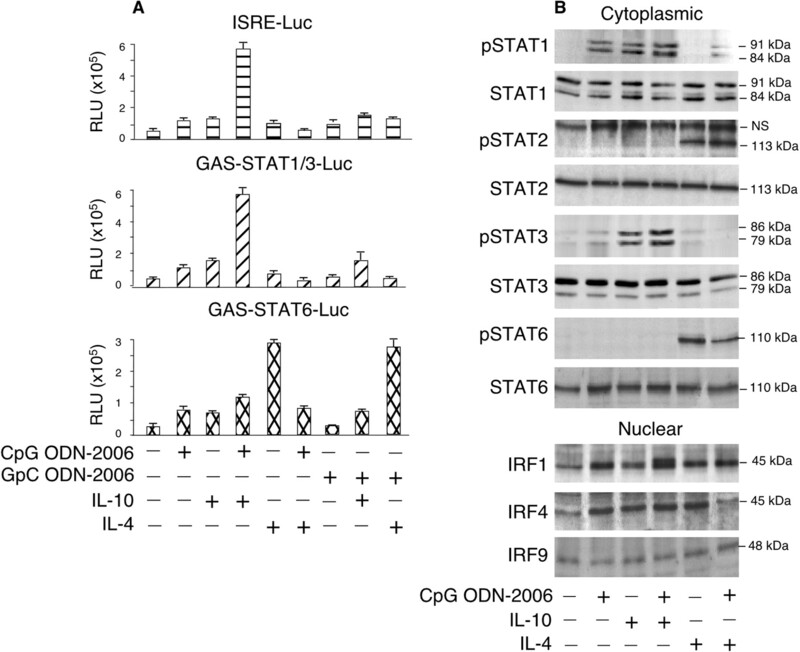 Although unable to significantly activate ISRE-Luc and STAT1/3-Luc, IL-4 activated STAT6-Luc more efficiently than CpG ODN-2006 and IL-10. This activation was attenuated by CpG ODN-2006, but not by GpC ODN-2006. These findings indicate that CpG DNA cooperates with IL-10, but not IL-4, to induce transcriptionally active STATs and IRFs. They also suggest that CpG DNA attenuates IL-4-induced, STAT6-dependent gene transcription. CpG DNA and IL-10 induce transcriptionally active STAT1, STAT3, IRF1, and IRF4 in human B cells. A, Activation of ISRE-Luc, GAS-STAT1/3-Luc, or GAS-STAT6-Luc in 2E2 B cells incubated with or without with or without CpG ODN-2006, GpC ODN-2006, IL-10, and/or IL-4 for 2 days. B, Cytoplasmic pSTAT1 and total STAT1 (91- and 84-kDa isoforms), pSTAT2, total STAT2, pSTAT3, and total STAT3 (88- and 83-kDa isoforms), pSTAT6, and total STAT6 in naive B cells cultured with or without CpG ODN-2006, IL-10, and/or IL-4 for 1 h. Nuclear IRF1, IRF4, and IRF9 are also shown. NS, nonspecific band. Data in A and B correspond to one of three experiments yielding similar results. STATs undergo nuclear translocation upon phosphorylation by Jaks (44), whereas IRFs undergo nuclear translocation upon phosphorylation by as yet elusive kinases, including IKKε and TANK-binding kinase 1 (TBK1) (56, 59). Naive B cells up-regulated STAT1 and STAT3 phosphorylation and induced IRF1 and IRF4 nuclear translocation upon exposure to CpG ODN-2006 or IL-10 for 1 h (Fig. 10⇑B). In contrast, CpG ODN-2006 or IL-10 did not affect STAT2 and STAT6 phosphorylation or IRF9 nuclear translocation. When combined with IL-10, CpG ODN-2006 elicited more STAT1 and STAT3 phosphorylation and more IRF1 and IRF4 nuclear translocation than CpG ODN-2006 or IL-10 alone. In addition to inducing IRF1 and IRF4 nuclear translocation, IL-4 elicited STAT2 and STAT6 phosphorylation. Notably, CpG ODN-2006 attenuated STAT6 (but not STAT2) phosphorylation and IRF4 (but not IRF1) nuclear translocation in B cells exposed to IL-4. Conversely, IL-4 attenuated STAT1 and STAT3 phosphorylation as well as IRF1 and IRF4 nuclear translocation in B cells exposed to CpG ODN-2006. Collectively, these findings indicate that CpG DNA cooperates with IL-10, but not IL-4, to activate STAT1, STAT3, IRF1, and IRF4 in B cells. They also suggest that CpG DNA interferes with the activation of STAT6 and IRF4 by IL-4. Having shown that CpG DNA cooperates with IL-10 to increase the binding of NF-κB-Rel-containing complexes a and b to ISRE-κB3 cis-Iγ3 (Fig. 9⇑, A and B), it was determined whether these complexes include IRFs and STATs (Fig. 10⇑). Consistent with this, the binding of complexes a and b to ISRE-κB3 was attenuated by incubating nuclear proteins from CpG ODN-2006-stimulated B cells with Abs to STAT1, IRF1, and IRF4 (Fig. 9⇑C). Further assays evaluated STAT and IRF binding to the GAS element of Iγ3. Naive B cells up-regulated the binding of complexes a, f, g, h, and i to GAS cis-Iγ3 upon exposure to CpG ODN-2006 for 6 h (Fig. 11⇓A). These complexes were attenuated or supershifted by Abs to STAT1, STAT3, IRF1, and IRF4; STAT1, STAT3, and IRF1; STAT1, IRF1, and IRF4; STAT1 and IRF4; and IRF4, respectively (Fig. 11⇓B). Finally, IL-10 alone or combined with CpG ODN-2006 induced more binding of complexes a, f, g, h, and i to GAS cis-Iγ3 than did CpG ODN-2006 alone. These findings indicate that CpG DNA and IL-10 cooperatively increase STAT and IRF binding to Iγ3. 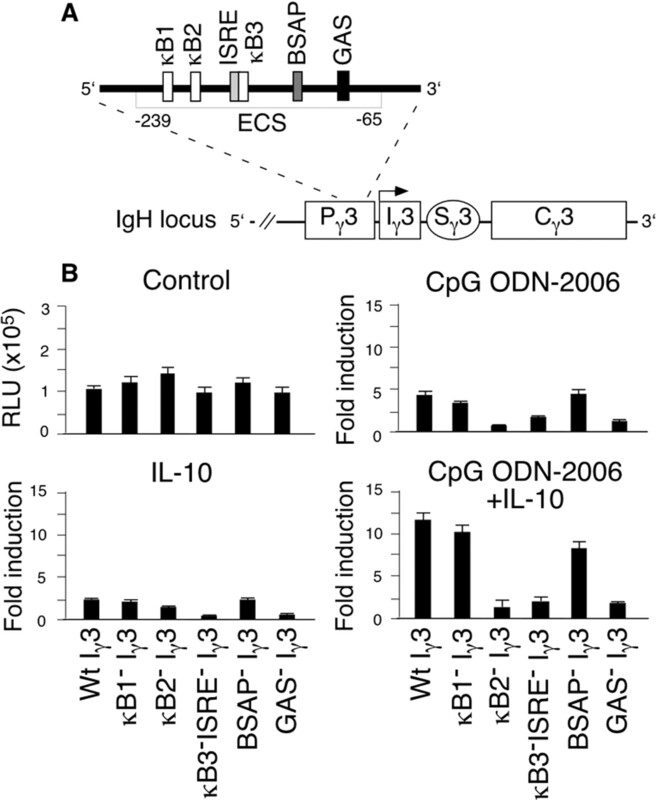 CpG DNA and IL-10 up-regulate STAT and IRF binding to GAS cis-Iγ3 in human B cells. A, Aligned −93/−70 Iγ3, Iγ1 and Iγ2 DNA sequences. The boxed sequence corresponds to the GAS motif. Gel shows binding of nuclear proteins to a radiolabeled oligonucleotide encompassing GAS cis-Iγ3 or a consensus Oct1 motif (loading control). 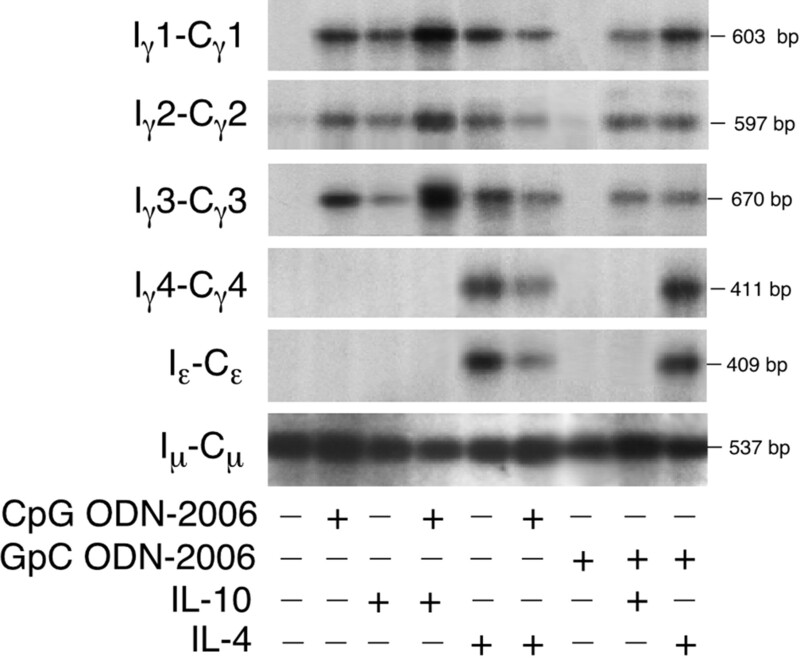 Nuclear proteins were from naive B cells incubated with or without CpG ODN-2006, IL-10, and/or IL-4 for 6 h. Italic letters indicate shifted protein-DNA complexes. B, GAS cis-Iγ3-binding protein-DNA complexes from naive B cells activated with CpG DNA after nuclear protein incubation with a cold probe or Abs to STAT1, STAT2, STAT3, STAT6, IRF1, IRF4, or IRF9. Asterisks indicate lanes in which complexes are attenuated or supershifted by the Ab. C, GAS cis-Iγ3-binding protein complexes from naive B cells activated with IL-4 after nuclear protein incubation with a cold probe or Abs to STAT1, STAT2, STAT3, STAT6, IRF1, IRF4, or IRF9. Asterisks indicate lanes in which complexes are attenuated or supershifted by the Ab. Data in A–C correspond to one of three experiments yielding similar results. IL-4 up-regulated the binding of complexes b, c, d, e, and i, but not a, f, g, and h, to GAS cis-Iγ3 (Fig. 11⇑A). Complexes b, c, d, e, and i were attenuated or supershifted by preincubating nuclear proteins with Abs to STAT6 and IRF4 (not shown), STAT6, STAT2 and STAT6, STAT2, and IRF4, respectively (Fig. 11⇑C). Compared with IL-4 alone, IL-4 and CpG ODN-2006 induced less binding of complexes b, c, and i to GAS cis-Iγ3, whereas the binding of complexes d and e remained unchanged. Finally, CpG ODN-2006 and IL-4 induced less binding of complexes f, g, h, and i to GAS cis-Iγ3 than CpG ODN-2006 alone. Thus, CpG DNA impairs IL-4-induced binding of STAT6 and IRF4 to Iγ3; conversely, IL-4 prevents CpG DNA-induced STAT1, STAT3, IRF1, and IRF4 binding to Iγ3. The involvement of NF-κB-Rel, STAT, and IRF proteins in CpG DNA-induced germline Cγ gene transcription was further evaluated in 2E2 B cells transfected with DN plasmids inhibiting the activation and/or DNA-binding activity of endogenous NF-κB-Rel, STAT1, STAT3, and IRF4. Enforced expression of DN-IκBα, DN-IKKα, DN-IKKβ, or, to a lesser extent, DN-NIK attenuated the activation of both Iγ3-Luc and κB-Luc in 2E2 B cells exposed to CpG ODN-2006 and IL-10 for 48 h (Fig. 12⇓). In similar B cells, enforced expression of DN-STAT1, DN-IRF4, or, to a lesser extent, DN-STAT3 attenuated activation of Iγ3-Luc but not that of κB-Luc. These findings provide additional evidence that CpG DNA and IL-10 initiate IgG CSR by activating NF-κB-Rel, STAT, and IRF proteins. CpG DNA and IL-10 require NIK, IKK, STAT1, STAT3, and IRF4 to activate the Iγ3 promoter in human B cells. Iγ3-Luc and κB-Luc activities in 2E2 B cells transfected with an empty expression vector (control) or with DN-IκBα, DN-IKKα, DN-IKKβ, DN-NIK, DN-STAT1, DN-STAT3, and DN-IRF4 expression vectors and subsequently incubated with CpG DNA ODN-2006 and IL-10 for 2 days. Data are presented as a percentage of the yield (fold activation of B cells transfected with an expression vector/fold activation of B cells not transfected with an expression vector × 100). Data correspond to one of three independent experiments yielding similar results (bars represent the SD of triplicate determinations). Marginal zone B cells and mucosal CD5+ B-1 cells generate a massive wave of extrafollicular Ab-producing plasmablasts in the initial 3 days of a primary Ab response through a mechanism that does not require T cell help (7). Although unable to induce affinity maturation and immune memory, early TI B cell responses lead to the production of IgM, IgG, and IgA, which play important roles in the initial control of infections by quickly replicating pathogens (7, 8). Previous evidence indicates that PAMPs initiate TI Ab responses by inducing extensive BCR cross-linking (9). Consistent with this, marginal zone and B-1 B cells recognize PAMPs through semiconserved BCRs encoded by a restricted set of Ig V(D)J genes carrying no or few mutations (11). In addition to cross-linking poorly diversified BCRs, PAMPs activate innate Ag receptors on B cells. This is exemplified by LPS, which stimulates TI IgM production and IgG CSR by engaging TLR4 on mouse B cells (1). Not only does LPS stimulate mouse B cells to produce bacteria-specific IgM and IgG upon dual BCR and TLR4 engagement, but it also elicits polyclonal Ab production through TLR4 only (1). LPS-induced IgG CSR and Ab production would be further enhanced by BAFF, a B cell-stimulating TNF family member produced by LPS-stimulated myeloid DCs (14, 16). Like BCR and TLR4 (10, 60), BAFF receptors on B cells activate NF-κB-Rel proteins (61), which are essential for both CSR and Ab production (1). This implies that early TI IgM and IgG production results from the stimulation of both germline and somatically recombined Ag receptors with intersecting NF-κB-Rel pathways. Human B cells lack TLR4 but express TLR9 (22), an intracellular pattern recognition receptor that detects CpG DNA from viruses and bacteria (18). Previous studies show that CpG DNA triggers B cell proliferation and TI IgM production (20, 24, 25), but do not clarify the role of CpG DNA in IgG CSR. By showing that CpG DNA elicits CSR to Cγ1, Cγ2, and Cγ3, our findings extend to human B cells recent data demonstrating that CpG DNA stimulates CSR to Cγ2a, Cγ2b, and Cγ3 in mouse B cells (62). Unlike LPS (1), CpG DNA does not elicit significant IgG production in the absence of additional stimuli. This might stem from the fact that TLR9 signals through a pathway distinct from that emanating from TLR4 (10, 22). In line with studies showing that CpG DNA induces IL-10 (22, 49) and synergizes with both IL-10 and BCR to activate B cells (24, 25), we found that CpG DNA cooperates with IL-10 and BCR cross-linking to up-regulate IgG. The expression of IgG is also enhanced by BAFF, which is released by myeloid DCs upon exposure to CpG DNA-inducible cytokines, such as IFN-α and IL-10 (14, 16, 19, 49). Low concentrations of microbial CpG DNA are thought to favor the activation of DNA-specific B cells through dual TLR9 and BCR engagement (27, 32, 33). This response would involve B-1 and marginal zone B cells expressing poorly diversified BCRs and might be important to facilitate rapid removal of immunogenic CpG DNA released by invading pathogens. Higher concentrations of microbial CpG DNA would trigger polyclonal B cell activation mainly through TLR9 (25). Although less specific, this response might be important to amplify IgG class switching and production in Ag-primed B cells. Not only would CpG DNA favor the initiation of early TI IgG responses, but it would also amplify later-appearing TD IgG responses. Consistent with this, our results extend previous findings indicating that CpG DNA enhances IgG production in B cells exposed to CD40L (49), a TNF family member expressed by CD4+ T cells upon activation by APCs (4). CpG DNA would further enhance TD IgG production by favoring the release of IFN-α (19, 22), a powerful inducer of key T cell-costimulating molecules on APCs (21). By showing that enforced B cell expression of ΔTIR-TLR9, DN-MyD88, DN-IRAK1, or DN-TRAF6 attenuates CpG DNA-induced, but not CD40L-induced, Iγ3 transcription and NF-κB-Rel activation, our data suggest that CpG DNA requires TLR9, MyD88, IRAK1, and TRAF6 to initiate IgG CSR. These findings are consistent with recently published data showing that TLR9 and MyD88 are required for the induction of IgG CSR in mouse B cells (62). That TLR9 accounts for CpG DNA-induced IgG CSR is also indicated by our observation that enforced B cell expression of TOLLIP, an adaptor protein that negatively regulates TLR signaling (53), or B cell exposure to chloroquine, an endosomal maturation inhibitor that interferes with CpG DNA-TLR9 interaction (39), attenuates the induction of Iγ3 transcription and NF-κB-Rel activation by CpG DNA. This inhibitory effect is specific, because TOLLIP and chloroquine do not affect Iγ3 transcription and NF-κB-Rel activation in B cells exposed to CD40L. In addition to inhibiting the CpG DNA-TLR9 interaction within the endosome, chloroquine and its derivatives might block as yet elusive CpG DNA receptors on the cell surface (22). This alternative mechanism could account for the inhibition of IgG CSR observed in our experiments, which were conducted with concentrations of chloroquine lower than those required to aspecifically inhibit the endocytic pathway. In agreement with the idea that CD40 signals through both TRAF2 and TRAF6, whereas TLR9 requires TRAF6, but not TRAF2 (10, 36, 47, 52), overexpression of DN-TRAF6 impairs Iγ3 and NF-κB-Rel activation in B cells exposed to either CpG DNA or CD40L. Conversely, overexpression of DN-TRAF2 dampens Iγ3 and NF-κB-Rel activation in B cells exposed to CD40L, but not in those exposed to CpG DNA. These findings imply that CpG DNA and CD40L trigger CpG DNA-induced IgG CSR through partially overlapping signaling pathways. NF-κB-Rel activation is essential for CpG DNA-induced IgG CSR, because overexpression of DN-IκBα and DN-IKK or disruption of κB2 and κB3 cis-Iγ3 sites impairs Cγ3 gene transcription in B cells exposed to CpG DNA. In agreement with previous studies showing that CpG DNA cooperates with IL-10, but not IL-4, to activate B cells (51, 52), we found that CpG DNA-induced Cγ transcription is selectively increased by IL-10. That CpG DNA preferentially cooperates with IL-10 to initiate IgG CSR is also indicated by our observation that IL-2, IL-6, IL-12, IL-13, and IL-15 fail to increase CpG DNA-induced Cγ gene transcription even though they are involved in various CpG DNA-mediated immune responses (22, 25, 49). Our findings suggest that IL-10 amplifies CpG DNA-induced CSR by increasing TLR9 expression and subsequent TLR9-mediated NF-κB-Rel activation. It is also likely that B cells exposed to CpG DNA and IL-10 rapidly up-regulate autocrine NF-κB-Rel-activating factors, including BAFF (14, 61, 63). In addition to inducing NF-κB-Rel, CpG DNA and IL-10 cooperatively activate STAT1, STAT3, IRF1, and IRF4, which are all implicated in the regulation of IgG CSR and Ab production (46, 54, 55, 56, 57, 58). IL-10 would activate STATs and IRFs through Jak1 (44), whereas CpG DNA would activate IRFs through IKKε and TBK1 (59). CpG DNA would also activate STATs by inducing autocrine release of IL-10 (22, 49). Our findings suggest that binding of STAT1, STAT3, IRF1, and IRF4 to ISRE and GAS cis-Iγ sites proximal to or partially overlapping with κB2 and κB3 enhances NF-κB-Rel-mediated germline Cγ gene transcription. This effect might be associated with STAT and IRF interaction with NF-κB-Rel. Consistent with this, STATs and IRFs enhance the transcription of several Ig and non-Ig gene promoters by forming heterocomplexes with NF-κB-Rel (1, 44, 54, 64). These heterocomplexes would stabilize NF-κB-Rel binding to the κB cis-acting site, thereby enhancing NF-κB-Rel-dependent gene trans-activation. That STATs and IRFs play a key role in CpG DNA-induced IgG CSR is further indicated by our observation that disruption of ISRE-κB3 and GAS cis-Iγ3 sites or enforced DN-STAT-1, DN-STAT3, or DN-IRF4 expression inhibits germline Cγ3 gene transcription in B cells exposed to CpG DNA and IL-10. By showing that CpG DNA impairs the IL-4-induced activation of Iγ and Iε promoters, our results extend previous findings indicating that CpG DNA inhibits IgG1 and IgE production in B cells exposed to IL-4 (49, 50). The mechanism underlying this inhibition remains unclear. IL-4 initiates CSR by eliciting phosphorylation-dependent activation of Jak3, an IL-4R-associated kinase that triggers STAT6 phosphorylation and nuclear translocation (65). Once in the nucleus, STAT6 triggers germline Cγ and Cε gene transcription upon binding to cis-acting GAS sites on Iγ and Iε promoters (1, 41, 64). This early CSR-associated event would be further amplified by IRF4 (57), an IL-4-inducible protein that binds GAS sites in association with STAT6 (46, 56). Our experiments suggest that CpG DNA inhibits IL-4-dependent germline Cγ and Cε gene transcription by attenuating IL-4-induced phosphorylation and nuclear translocation of STAT6 and IRF4. This effect might derive from the activation of Jak3 phosphatases, including CD45, a transmembrane receptor with Jak phosphatase activity (66). Consistent with this, recent studies indicate that CD45 engagement attenuates IL-4-induced IgE CSR in B cells by preventing the phosphorylation of STAT6 by Jak3 (67). Notably, CpG DNA does not attenuate the IL-4-induced activation and nuclear translocation of STAT2. This transcription factor is activated by IFN-α (44), a known IL-4 signaling inhibitor (68), and would negatively regulate IL-4-induced Cγ and Cε gene transcription by limiting the GAS-binding and/or the transcriptional activity of STAT6 (55). CpG DNA might also attenuate IL-4-induced Cγ and Cε gene transcription by up-regulating the transcriptional repressor Bcl-6 (69). A similar function has been recently attributed to T-bet, a T-box transcriptional regulator induced by CpG DNA (50). Yet, the fact that T-bet is heavily involved in TI IgG production (70) suggests that T-bet may induce, rather than inhibit, IgG CSR at least in B cells exposed to CpG DNA and IL-10. Notably, not only is IL-4 signaling inhibited by CpG DNA, but it also inhibits CpG DNA-induced STAT1, STAT3, and IRF4 activation, possibly through a mechanism involving down-regulation of TLR9 expression. This implies that CpG DNA and IL-4 reciprocally turn off their signaling pathways. Marginal zone and B-1 B cells express poorly diversified Abs that target microbial molecular patterns, such as CpG DNA, often shared by highly conserved intracellular self-Ags (11). This would explain the facility with which marginal zone and B-1 clones are recruited into autoreactive responses (11, 71). If tightly controlled, the natural self-reactivity of marginal zone and B-1 B cells would be important to optimize the removal of immune-stimulating products released by dying cells. This is exemplified by natural anti-DNA Abs, which facilitate the removal of apoptotic CpG DNA in addition to neutralizing microbial CpG DNA. The clearance of CpG DNA would be further enhanced by RFs, which target IgG-bound DNA (11). Thus, autoreactive marginal zone and B-1 B cells might be useful to prevent untoward autoimmune responses initiated by cross-reactive TI Ags. Yet in the presence of persistent or repetitive TI activation, the natural autoantibody repertoire would become pathogenic. This would entail both quantitative and qualitative changes, including increased switching from IgM to IgG. Previous studies indicate that dual TLR9 and BCR engagement by endogenous hypomethylated CpG stimulates autoreactive B cells to produce anti-DNA IgM and IgM-RFs (32, 33). Our findings suggest that a similar TI pathway might induce the production of autoreactive IgG. Consistent with this, CpG DNA administration augments the production of pathogenic DNA-reactive IgG in lupus-prone mice (72). In SLE and RA, tissue damage stems from deposition of pathogenic IgG targeting a relatively limited set of self-Ags, including DNA (31). Unlike IgM, IgG activate powerful FcγRs on proinflammatory immune cells, including neutrophils, and therefore are highly pathogenic (29, 30). Although IgG CSR is known to play a key role in the pathogenesis of SLE and RA, the mechanisms leading to its dysregulation remain unclear. By showing that TLR9 signaling initiates IgG CSR in B cells, our findings suggest that factors increasing the availability of hypomethylated CpG DNA may facilitate the production of pathogenic IgG in predisposed subjects. Consistent with this, microbial infections, extensive cell death, or drugs inhibiting DNA methylation, such as procainamide, often initiate or exacerbate anti-DNA IgG responses as well as SLE and RA manifestations (29, 30, 71, 73). Low concentrations of CpG DNA and CpG DNA-IgG immune complexes would induce anti-DNA IgG and RF-IgG by stimulating B cells through both TLR9 and BCR (26, 27, 32, 33), whereas high concentrations of CpG DNA would elicit polyclonal IgG production by stimulating B cells through TLR9 only (25). The IgG-inducing activity of self and microbial CpG DNA would be further enhanced by IFN-α and IL-10 (16, 70, 74), two CpG DNA-inducible cytokines abnormally increased in patients with SLE and RA (22, 31, 49, 75, 76). CpG DNA, IFN-α, and IL-10 would further amplify autoreactive IgG production by up-regulating BAFF (14, 16, 77), a key innate player in the pathogenesis of IgG-mediated autoimmune disorders (17, 31, 78). Thus, it is conceivable that chloroquine attenuates SLE and RA clinical manifestations because of its ability to inhibit multiple CpG DNA-inducible pathways, leading autoreactive B cells to switch from IgM to a more pathogenic IgG isotype. We thank Drs. A. B. Pernis (Columbia University College of Physicians and Surgeons, New York, NY); K. Horvath (Mount Sinai Medical Center, New York, NY); J. J. Zhang, J. E. Darnell, Jr., and Jackeline Bromberg (Rockefeller University, New York, NY); Z. Cao (Tularik, San Francisco, CA); and J.-D. Li (University of South California, Los Angeles, CA) for their help with reagents. ↵1 This work was supported by National Institutes of Health Grants AR47872 and AI057130 (to A.C.). ↵3 Abbreviations used in this paper: CSR, class switch DNA recombination; AID, activation-induced deaminase; BAFF, B cell-activating factor of the TNF family; BSAP, B cell-specific activating protein-binding site; DC, dendritic cell; DN, dominant negative; ECS, evolutionarily conserved sequence; GAS, IFN-γ-activated sequence; IKK, IκB kinase; IRAK, IL-1R-associated kinase; IRF, IFN-responsive factor; ISRE, IFN-stimulated responsive element; Luc, luciferase reporter plasmid; NIK, NF-κB-inducing kinase; ODN, oligodeoxynucleotide; p, phospho; PAMP, pathogen-associated molecular pattern; RA, rheumatoid arthritis; RF, rheumatoid factor; SLE, systemic lupus erythematosus; TD, T cell-dependent; TI, T cell-independent; TIR, TLR/IL-1R domain; TOLLIP, Toll-interacting protein; TRAF, TNFR-associated factor. Stavnezer, J.. 1996. Antibody class switching. Adv. Immunol. 61:79. Manis, J. P., M. Tian, F. W. Alt. 2002. Mechanism and control of class-switch recombination. Trends Immunol. 23:31. Van Kooten, C., J. Banchereau. 1996. CD40-CD40 ligand: a multifunctional receptor-ligand pair. Adv. Immunol. 61:1. Tarlinton, D. M., K. G. Smith. 2000. Dissecting affinity maturation: a model explaining selection of antibody-forming cells and memory B cells in the germinal centre. Immunol. Today 21:436. Fagarasan, S., T. Honjo. 2000. T-Independent immune response: new aspects of B cell biology. Science 290:89. MacLennan, I., C. Vinuesa. 2002. Dendritic cells, BAFF, and APRIL: innate players in adaptive antibody responses. Immunity 17:235. Mond, J. J., Q. Vos, A. Lees, C. M. Snapper. 1995. T cell independent antigens. Curr. Opin. Immunol. 7:349. Balazs, M., F. Martin, T. Zhou, J. Kearney. 2002. Blood dendritic cells interact with splenic marginal zone B cells to initiate T-independent immune responses. Immunity 17:341. Janeway, C. A., C. A. Jr, R. Medzhitov. 2002. Innate immune recognition. Annu. Rev. Immunol. 20:197. Nardelli, B., O. Belvedere, V. Roschke, P. A. Moore, H. S. Olsen, T. S. Migone, S. Sosnovtseva, J. A. Carrell, P. Feng, J. G. Giri, et al 2001. Synthesis and release of B-lymphocyte stimulator from myeloid cells. Blood 97:198. Schneider, P., F. MacKay, V. Steiner, K. Hofmann, J. L. Bodmer, N. Holler, C. Ambrose, P. Lawton, S. Bixler, H. Acha-Orbea, et al 1999. BAFF, a novel ligand of the tumor necrosis factor family, stimulates B cell growth. J. Exp. Med. 189:1747. Litinskiy, M. B., B. Nardelli, D. M. Hilbert, B. He, A. Schaffer, P. Casali, A. Cerutti. 2002. DCs induce CD40-independent immunoglobulin class switching through BLyS and APRIL. Nat. Immunol. 3:822. Mackay, F., P. Schneider, P. Rennert, J. Browning. 2003. BAFF and APRIL: a tutorial on B cell survival. Annu. Rev. Immunol. 21:231. Hemmi, H., O. Takeuchi, T. Kawai, T. Kaisho, S. Sato, H. Sanjo, M. Matsumoto, K. Hoshino, H. Wagner, K. Takeda, et al 2000. A Toll-like receptor recognizes bacterial DNA. Nature 408:740. Bauer, S., C. J. Kirschning, H. Hacker, V. Redecke, S. Hausmann, S. Akira, H. Wagner, G. B. Lipford. 2001. Human TLR9 confers responsiveness to bacterial DNA via species-specific CpG motif recognition. Proc. Natl. Acad. Sci. USA 98:9237. Katze, M. G., Y. He, M. Gale, Jr. 2002. Viruses and interferon: a fight for supremacy. Nat. Rev. Immunol. 2:675. Latz, E., A. Schoenemeyer, A. Visintin, K. A. Fitzgerald, B. G. Monks, C. F. Knetter, E. Lien, N. J. Nilsen, T. Espevik, D. T. Golenbock. 2004. TLR9 signals after translocating from the ER to CpG DNA in the lysosome. Nat. Immunol. 5:190. Krieg, A. M., A. K. Yi, S. Matson, T. J. Waldschmidt, G. A. Bishop, R. Teasdale, G. A. Koretzky, D. M. Klinman. 1995. CpG motifs in bacterial DNA trigger direct B-cell activation. Nature 374:546. Krieg, A. M.. 2002. A role for Toll in autoimmunity. Nat. Immunol. 3:423. Vinuesa, C. G., C. C. Goodnow. 2002. Immunology: DNA drives autoimmunity. Nature 416:595. Richardson, B., L. Scheinbart, J. Strahler, L. Gross, S. Hanash, M. Johnson. 1990. Evidence for impaired T cell DNA methylation in systemic lupus erythematosus and rheumatoid arthritis. Arthritis Rheum. 33:1665. Goronzy, J. J., C. M. Weyand. 1995. T and B cell-dependent pathways in rheumatoid arthritis. Curr. Opin. Rheumatol. 7:214. Kotzin, B. L.. 1996. Systemic lupus erythematosus. Cell 85:303. Plotz, P. H.. 2003. The autoantibody repertoire: searching for order. Nat. Rev. Immunol. 3:73. Viglianti, G. A., C. M. Lau, T. M. Hanley, B. A. Miko, M. J. Shlomchik, A. Marshak-Rothstein. 2003. Activation of autoreactive B cells by CpG dsDNA. Immunity 19:837. Ghosh, S., M. Karin. 2002. Missing pieces in the NF-κB puzzle. Cell 109:(Suppl.):S81. Pomerantz, J. L., D. Baltimore. 2002. Two pathways to NF-κB. Mol. Cell 10:693. Cao, Z., J. Xiong, M. Takeuchi, T. Kurama, D. V. Goeddel. 1996. TRAF6 is a signal transducer for interleukin-1. Nature 383:443. Yi, A. K., R. Tuetken, T. Redford, M. Waldschmidt, J. Kirsch, A. M. Krieg. 1998. CpG motifs in bacterial DNA activate leukocytes through the pH-dependent generation of reactive oxygen species. J. Immunol. 160:4755. Schaffer, A., A. Cerutti, H. Zan, P. Casali. 1999. The evolutionary conserved sequence upstream of the human Sγ3 region is a functional promoter: synergistic activation by CD40 ligand and IL-4 via distinct cis regulatory elements. J. Immunol. 162:5327. Thienes, C. P., L. De Monte, S. Monticelli, M. Busslinger, H. J. Gould, D. Vercelli. 1997. The transcription factor B cell-specific activator protein (BSAP) enhances both IL-4- and CD40-mediated activation of the human ε germline promoter. J. Immunol. 158:5874. Schaffer, A., E. C. Kim, X. Wu, H. Zan, L. Testoni, S. Salamon, A. Cerutti, P. Casali. 2003. Selective inhibition of class switching to IgG and IgE by recruitment of the HoxC4 and Oct-1 homeodomain proteins and Ku70/Ku86 to newly identified ATTT cis-elements. J. Biol. Chem. 278:23141. Sha, W., H.-C. Liou, E. Tuomanen, D. Baltimore. 1995. Targeted disruptionof the p50 subunit of NF-κB leads to multifocal defects in immune responses. Cell 80:321. Levy, D. E., J. E. Darnell, Jr. 2002. Stats: transcriptional control and biological impact. Nat. Rev. Mol. Cell. Biol. 3:651. Rodriguez, J. J., J. P. Parisien, C. M. Horvath. 2002. Nipah virus V protein evades α and γ interferons by preventing STAT1 and STAT2 activation and nuclear accumulation. J. Virol. 76:11476. Gupta, S., M. Jiang, A. Anthony, A. B. Pernis. 1999. Lineage-specific modulation of interleukin 4 signaling by interferon regulatory factor 4. J. Exp. Med. 190:1837. Leo, E., J. M. Zapata, J. Reed. 1999. CD40-mediated activation of Ig Cγ1 and Ig Cε germ-line promoters involves multiple TRAF family proteins. Eur. J. Immunol. 29:3908. Shuto, T., H. Xu, B. Wang, J. Han, H. Kai, X. X. Gu, T. F. Murphy, D. J. Lim, J. D. Li. . 2001. Activation of NF-κB by nontypeable Hemophilus influenzae is mediated by Toll-like receptor 2-TAK1-dependent NIK-IKKα/β-IκBα and MKK3/6-p38 MAP kinase signaling pathways in epithelial cells. Proc. Natl. Acad. Sci. USA 98:8774. Gantner, F., P. Hermann, K. Nakashima, S. Matsukawa, K. Sakai, K. B. Bacon. 2003. CD40-dependent and -independent activation of human tonsil B cells by CpG oligodeoxynucleotides. Eur. J. Immunol. 33:1576. Liu, N., N. Ohnishi, L. Ni, S. Akira, K. B. Bacon. 2003. CpG directly induces T-bet expression and inhibits IgG1 and IgE switching in B cells. Nat. Immunol. 4:687. Cerutti, A., H. Zan, A. Schaffer, L. Bergsagel, N. Harindranath, E. E. Max, P. Casali. 1998. CD40 ligand and appropriate cytokines induce switching to IgG, IgA, and IgE and coordinated germinal center and plasmacytoid phenotypic differentiation in a human monoclonal IgM+IgD+ B cell line. J. Immunol. 160:2145. Bishop, G. A., B. S. Hostager. 2001. B lymphocyte activation by contact-mediated interactions with T lymphocytes. Curr. Opin. Immunol. 13:278. Burns, K., J. Clatworthy, L. Martin, F. Martinon, C. Plumpton, B. Maschera, A. Lewis, K. Ray, J. Tschopp, F. Volpe. 2000. Tollip, a new component of the IL-1RI pathway, links IRAK to the IL-1 receptor. Nat. Cell. Biol. 2:346. Gupta, S., D. Xia, M. Jiang, S. Lee, A. B. Pernis. 1998. Signaling pathways mediated by the TNF- and cytokine-receptor families target a common cis-element of the IFN regulatory factor 1 promoter. J. Immunol. 161:5997. Gupta, S., M. Jiang, A. B. Pernis. 1999. IFN-α activates Stat6 and leads to the formation of Stat2:Stat6 complexes in B cells. J. Immunol. 163:3834. Mittrucker, H. W., T. Matsuyama, A. Grossman, T. M. Kundig, J. Potter, A. Shahinian, A. Wakeham, B. Patterson, P. S. Ohashi, T. W. Mak. 1997. Requirement for the transcription factor LSIRF/IRF4 for mature B and T lymphocyte function. Science 275:540. Lu, B., C. Ebensperger, Z. Dembic, Y. Wang, M. Kvatyuk, T. Lu, R. L. Coffman, S. Pestka, P. B. Rothman. 1998. Targeted disruption of the interferon-γ receptor 2 gene results in severe immune defects in mice. Proc. Natl. Acad. Sci. USA 95:8233. Fitzgerald, K. A., S. M. McWhirter, K. L. Faia, D. C. Rowe, E. Latz, D. T. Golenbock, A. J. Coyle, S. M. Liao, T. Maniatis. 2003. IKKepsilon and TBK1 are essential components of the IRF3 signaling pathway. Nat. Immunol. 4:491. Niiro, H., E. A. Clark. 2002. Regulation of B-cell fate by antigen-receptor signals. Nat. Rev. Immunol. 2:945. Mackay, F., J. L. Browning. 2002. BAFF: a fundamental survival factor for B cells. Nat. Rev. Immunol. 2:465. Lin, L., A. J. Gerth, S. L. Peng. 2004. CpG DNA redirects class-switching towards “Th1-like” Ig isotype production via TLR9 and MyD88. Eur. J. Immunol. 34:1483. He, B., N. Raab-Traub, P. Casali, A. Cerutti. 2003. EBV-encoded latent membrane protein 1 cooperates with BAFF/BLyS and APRIL to induce T cell-independent Ig heavy chain class switching. J. Immunol. 171:5215. Shen, C. H., J. Stavnezer. 1998. Interaction of stat6 and NF-κB: direct association and synergistic activation of interleukin-4-induced transcription. Mol. Cell. Biol. 18:3395. Geha, R. S., H. H. Jabara, S. R. Brodeur. 2003. The regulation of immunoglobulin E class-switch recombination. Nat. Rev. Immunol. 3:721. Irie-Sasaki, J., T. Sasaki, W. Matsumoto, A. Opavsky, M. Cheng, G. Welstead, E. Griffiths, C. Krawczyk, C. D. Richardson, K. Aitken, et al 2001. CD45 is a JAK phosphatase and negatively regulates cytokine receptor signalling. Nature 409:349. Zhou, C., A. Saxon, K. Zhang. 2003. Human activation-induced cytidine deaminase is induced by IL-4 and negatively regulated by CD45: implication of CD45 as a Janus kinase phosphatase in antibody diversification. J. Immunol. 170:1887. Pene, J., F. Rousset, F. Briere, I. Chretien, J. Y. Bonnefoy, H. Spits, T. Yokota, N. Arai, K. Arai, J. Banchereau, et al 1988. IgE production by normal human lymphocytes is induced by interleukin 4 and suppressed by interferons γ and α and prostaglandin E2. Proc. Natl. Acad. Sci. USA 85:6880. Harris, M. B., C. C. Chang, M. T. Berton, N. N. Danial, J. Zhang, D. Kuehner, B. H. Ye, M. Kvatyuk, P. P. Pandolfi, G. Cattoretti, et al 1999. Transcriptional repression of Stat6-dependent interleukin-4-induced genes by BCL-6: specific regulation of iepsilon transcription and immunoglobulin E switching. Mol. Cell. Biol. 19:7264. Peng, S. L., S. J. Szabo, L. H. Glimcher. 2002. T-bet regulates IgG class switching and pathogenic autoantibody production. Proc. Natl. Acad. Sci. USA 99:5545. Ray, S. K., C. Putterman, B. Diamond. 1996. Pathogenic autoantibodies are routinely generated during the response to foreign antigen: a paradigm for autoimmune disease. Proc. Natl. Acad. Sci. USA 93:2019. Anders, H. J., V. Vielhauer, V. Eis, Y. Linde, M. Kretzler, G. Perez de Lema, F. Strutz, S. Bauer, M. Rutz, H. Wagner, et al 2004. Activation of Toll-like receptor-9 induces progression of renal disease in MRL-Fas(lpr) mice. FASEB J. 18:534. Yung, R. L., J. Quddus, C. E. Chrisp, K. J. Johnson, B. C. Richardson. 1995. Mechanism of drug-induced lupus. I. Cloned Th2 cells modified with DNA methylation inhibitors in vitro cause autoimmunity in vivo. J. Immunol. 154:3025. Jego, G., A. K. Palucka, J. P. Blanck, C. Chalouni, V. Pascual, J. Banchereau. 2003. Plasmacytoid dendritic cells induce plasma cell differentiation through type I interferon and interleukin 6. Immunity 19:225. Bennett, L., A. K. Palucka, E. Arce, V. Cantrell, J. Borvak, J. Banchereau, V. Pascual. 2003. Interferon and granulopoiesis signatures in systemic lupus erythematosus blood. J. Exp. Med. 197:711. Boule, M. W., C. Broughton, F. Mackay, S. Akira, A. Marshak-Rothstein, I. R. Rifkin. 2004. Toll-like receptor 9-dependent and -independent dendritic cell activation by chromatin-immunoglobulin G complexes. J. Exp. Med. 199:1631. Banchereau, J., V. Pascual, A. K. Palucka. 2004. Autoimmunity through cytokine-induced dendritic cell activation. Immunity 20:539.